Image caption The Guantanamo Bay facility is used to detain what the US government calls "enemy combatants"
Ghana's president has strongly defended the government's decision to allow two Yemenis freed from Guantanamo Bay to live in the West African state. Opposition and church groups had condemned the decision, saying the men were a security threat. However, Mr Mahama said a Ghanaian was more likely to die in a road accident than at the hands of the Yemenis. The men said they looked forward to living in Ghana, and had followed the national football team in prison. Khalid al-Dhuby and Mahmoud Omar Bin Atef were held at the US prison in Cuba for more than a decade without being charged. 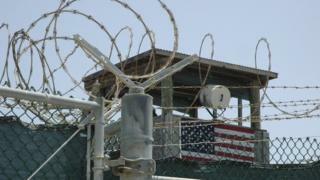 They are the first Guantanamo detainees that Ghana has accepted, at the request of the US. The jail was set up following the 11 September 2001 attacks in the US to detain what Washington called "enemy combatants". US President Barack Obama has said he wants to close the jail down before he leaves office in 2017. Speaking at a press conference in the capital, Accra, Mr Mahama said that Guantanamo Bay was a "blot on the human rights record of the world". "They [the men] just want to pick up the pieces of their lives and live normally. We don't have anything to fear," Mr Mahama said, adding that Mr al-Dhuby and Mr Atef were living in a security compound. He dismissed as "absolutely untrue" allegations that Ghana had received money from the US to take the detainees. Earlier, the influential Ghana Catholic Bishops Conference called the Yemenis "time bombs" who should be "sent back to wherever they came from". The opposition New Patriotic Party (NPP) said that official US documents showed the men had "violent and dangerous profiles". "Why is government straining to paint a picture of the two detainees as harmless, misunderstood and wrongly detained persons?" it asked. The two men were captured in Afghanistan, following the US-led invasion to overthrow the Taleban government in 2011. Mr al-Dhuby and Mr Atef have denied belonging to militant groups. "We have been wrongly arrested for 14 years without any charge against us," Mr Atef told Ghana's public radio station Uniiq FM. "We have suffered but we are not looking for revenge," he said. Mr Atef said they were huge fans of Ghana footballer Asamoah Gyan, and many of the detainees at Guantanamo Bay supported the Black Stars at the 2010 World Cup in South Africa. "When Ghana beat America, we were very happy. We made some celebrations. We also told the guards that we've won," Mr Atef said. Ghana beat the US 2-1, with Gyan scoring the winning goal in extra-time, which sent the Black Stars through to the quarter-finals. Dozens of countries have received former Guantanamo Bay detainees, including other African states such as Uganda and Cape Verde. A total of 780 men have been held at Guantanamo Bay since 2002, the vast majority without charge or criminal trial. The US navy base now has 105 detainees, nearly 50 of whom have been cleared for release. Guantanamo Bay: What next for Cuba prison camp?